"At the height of drama"
Once a shipping and rail mecca, this little big city has seen itself reinvented time and again. Located on the shore of the Massachusetts coast, Emerald Heights is in the midst of a boom. The Story of Emerald Heights tells the tale of struggle between legacy and power, loyalty and opportunity; of families united, families divided, conquered and rejoined. New segments are posted every Monday and Wednesday. 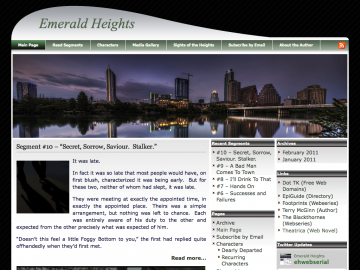 Emerald Heights has not been reviewed yet. Emerald Heights has not been recommended yet.